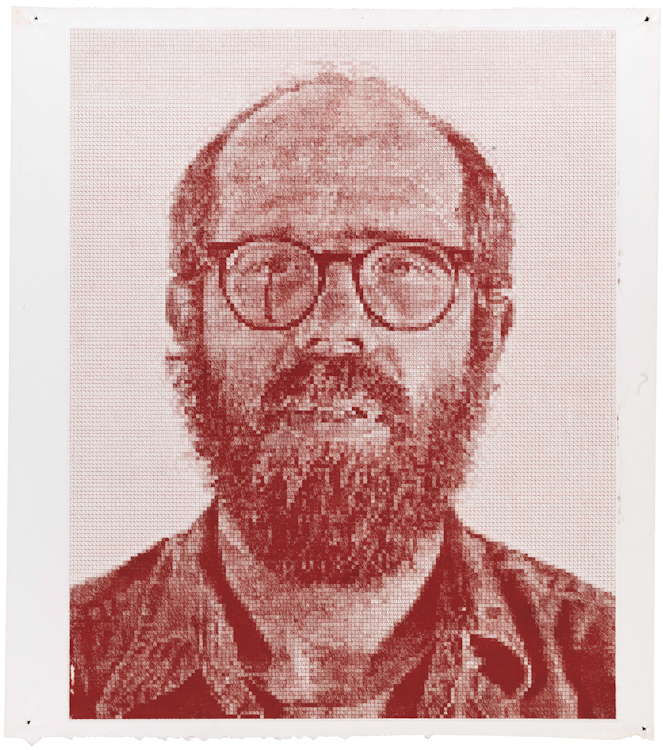 In 1972, Chuck Close came to Oakland’s Crown Point Press with the express goal of mastering the art of printmaking. The special exhibition currently on view in the Anderson Gallery at the de Young Museum, Chuck Close and Crown Point Press: Prints and Processes , examines this groundbreaking period in the artist’s career. In an earlier post, we discussed the mezzotint print Keith in the context of its 40th anniversary. Today, we take a closer look at Chuck Close’s Self-Portrait, completed in 1977. When Chuck Close completed his graduate studies at Yale at the end of the 1960s, representative painting was, in his words, “dead.” The relative dearth of artistic production in this field proved appealing to Close, who had made a choice to make art hard for himself. Later, this same tendency would lead him into the challenging world of printmaking. This exhibition shows the development of Close’s printmaking style at Crown Point Press from a tonal process akin to his Photorealist techniques (which involved overlaying a grid on a photograph and then transferring the image cell by cell onto a canvas) to the linear mark-making and exposition of the transfer grid that became the hallmark of his painting in the 1970s. One of the nice things about etching is that it’s very physical. When I made the etching, I was physically scratching and using quite a bit of pressure. It was like pull through, drag through, scratch through…In the new etching, I found myself getting involved with scratching lines. That interest in a more traditionally graphic approach—one of the starkest things you can do with an etching is a scratched line—that again has influenced my thinking about drawings, and I’ve been doing drawings which reflect the experience I’ve had. Another challenge Close faced when working with the inherently demanding medium of intaglio was his inability to proof his composition as he developed it on the copper plate. He spent months in his New York studio scratching his portrait into the protective hard ground, and it wasn’t until he returned to Crown Point’s Oakland studio with the plate that the printer, Patrick Foy, discovered a problem. Close had drawn his lines very close together in those areas that he intended to be the darkest. Unbeknownst to the artist, when immersed in acid these lines would run together, and ultimately print gray if left untreated. Foy recommended aquatint as the solution and applied it to the entire plate, thereby realizing Close’s original concept. 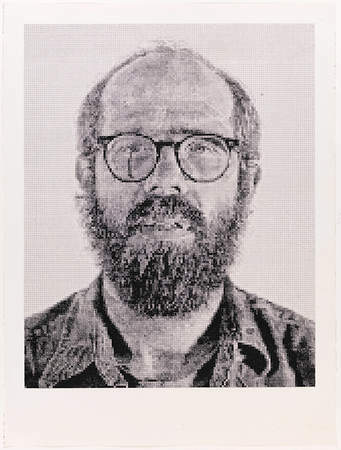 Perhaps the most astonishing aspect of Chuck Close’s preferred subject matter, the human face, is the fact that he cannot actually recognize it. Close suffers from Prosopagnosia, also known as face blindness, a condition that prevents him from registering individual facial distinctions. For him, the process of breaking down the human landscape into a flattened grid provides a map by which he can memorize faces, even his own. For more on this weird and fascinating aspect of Close’s process, check out Stephen Colbert’s interview with the artist. 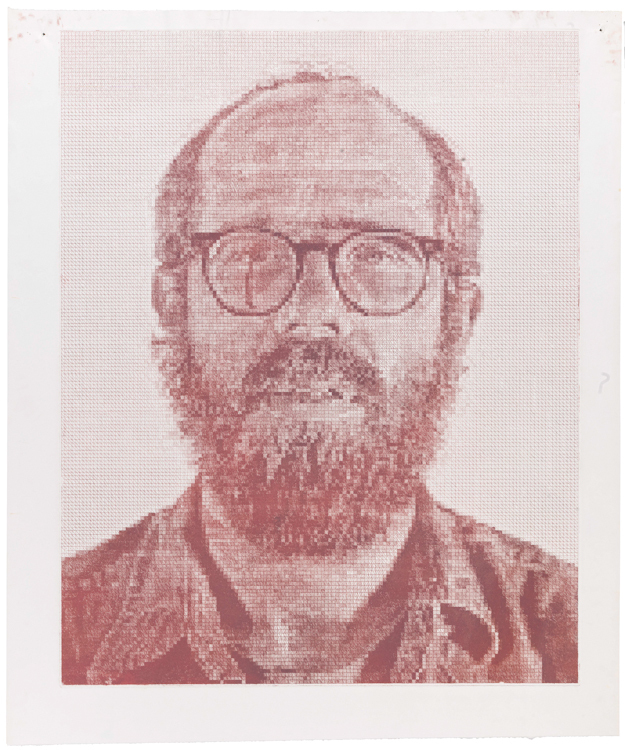 Chuck Close and Crown Point Press: Prints and Processes is on view at the de Young through October 14, 2012. 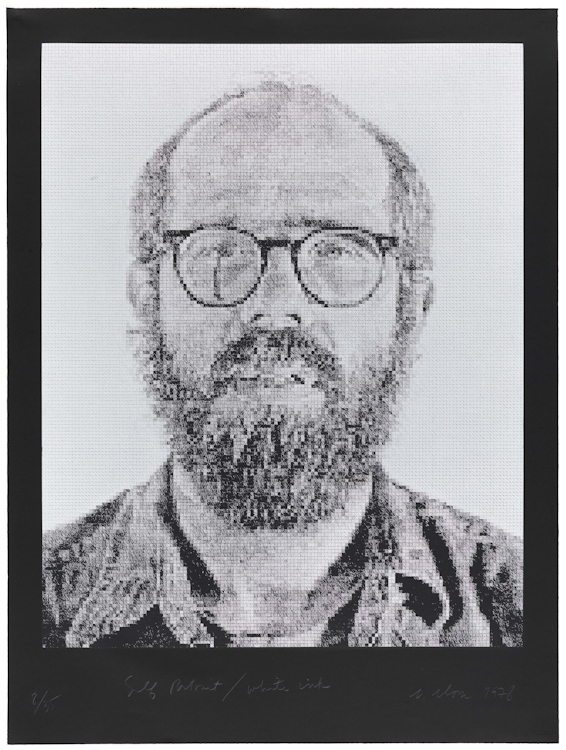 Further Reading: “Changing Variables: Chuck Close & His Prints” by Michael Shapiro in The Print Collector’s Newsletter (Vol. IX, No. 3, July–August 1978), p. 69.